So I think I need to make Business cards..
What goes on a Cartoonist's business card? if you've got one, lets see it! I subscribed to this thread because I would also like to know! 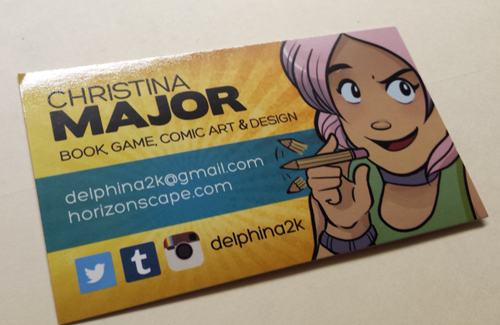 I do have some business cards I picked up at conventions stashed away in my office somewhere. if I can find them, I'll post them for you. That's a really good question!! I hesitated on getting proper business cards for years because I was afraid of regretting whatever information I put onto it (What if I'm not using Behance anymore next year? What if I change my email? 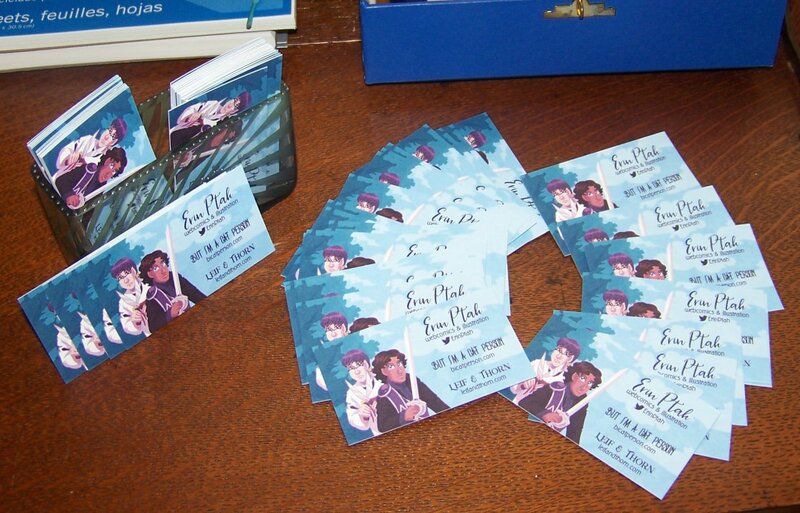 ), so I kept printing them onto a sheet of paper and cutting them out in tiny batches. This gets very old very fast, though, so eventually I just committed to what I felt was a bare minimum of information-- my main website's URL, and my most common screenname with some social media icons to indicate that's where I can be found. I'm currently using two different cards with basically the same theme-- an image on the front, and my information on a neutral-ish space on the back. This was pretty easy to design because I didn't have to try to fit both into one image area, but it is more expensive to print, which is definitely a factor. Here are the cards in question-- I didn't realize until it was too late that I forgot to include my email (so it goes with this stuff), but if anyone taking the card actually wants to find me, it's pretty easy to do so via the contact information on the URL which I did remember to print. The Follow-Me Card- This is the way to go if you're not selling anything but a casually interested audience wants to "take a card". Getting them engaged on the things you regularly update, whether that's social media, your store, and/or your webcomic, but leave most of the other personal contact info off. The Professional Card - Going to network with professionals? Hoping to get a career or a follow-back by someone who might hire you or work with you in the future? Make your card about your name/face, what you do (your job titles and a link to relevant portfolios for said jobs), and the best ways of contacting you (email, social media, etc.). I tend to not set this kind of card out for general people to grab, since I want to have actually talked to this person and use this as a follow-up for further connection. The Come-Again Card - Go to a lot of conventions? Have a robust online store full of great offerings? Showcase your most iconic work on your card and include your card with your merch so that when people buy things from you, they know where to find your store again to buy more or follow a relevant store account! And maybe get a sweet discount? That's nice too! I don't have one of these yet, but this thread is making me feel guilty and I really should. Having different cards for different purposes sounds like a really good idea! I've only got the one at the moment (albeit with two different backs), and I'm thinking I should at least work up a comic-specific one at some point. I figure website and e-mail address are probably the most important general purpose things. I put Facebook and Twitter information on there also because I keep having people want to communicate that way instead of by e-mail. The first time I got business cards I way overbought them much too early, and ended up with a whole bunch of cards that were quickly out of date. I went with a much smaller 50/50 split of the two backs this time. I'm really not sure how many is a good idea to keep on hand in general. When planning a Realm of Owls business card, we didn’t want to simply hand out contact info, but we aimed to cause some kind of a positive impact. Something that showed at a first glance what kind of a comic RoO is as well as maybe draw out a little chuckle at the same time, making people to hopefully remember us better. Thus we ended up with a folded card (made of down-to-earth Kraft paper) with a two-panel strip inside. The strip is an original, aimed to play with people’s way of opening folded material. It’s been real fun to see how different people react to the design and it seems to be able to cause the impact we wanted. As for the info on the card, we decided to go with only the name of the comic plus the web address, because people would get further information by visiting the site. We’ll expand the info with the next batch if we see the need, but at least now we have something to give people when we’re babbling about our comic! Thus we ended up with a folded card (made of down-to-earth Kraft paper) with a two-panel strip inside. The strip is an original, aimed to play with people’s way of opening folded material. It’s been real fun to see how different people react to the design and it seems to be able to cause the impact we wanted. This card is beautiful! I would consider adding somewhere that it's a comic, but it definitely made me laugh! I didn't want to post here until my new cards came in. I just reordered my cards, and changed the back quite drastically to better reflect the current (or upcoming) plot lines in my comics. I did two sided cards, one side for my books and the other for my webcomics. That way I rather cross pollinate when I give away my business cards to others. Okay I have NO idea why that showed sideways. I'm going to be trying to design some cards for thought bubble since even if I'm not selling anything there if someone I talk to asks for a link to my webcomic I can just hand them my card and not awkwardly try to find something to write one. XD So this information is useful! Come-Again Cards are soooo useful. I don't know how many times I order a thing and then completely forget where I got it or who made it. But I can sort through my card collection, match the item to the card, and find them again! If I ever make merch I'm definitely making one. 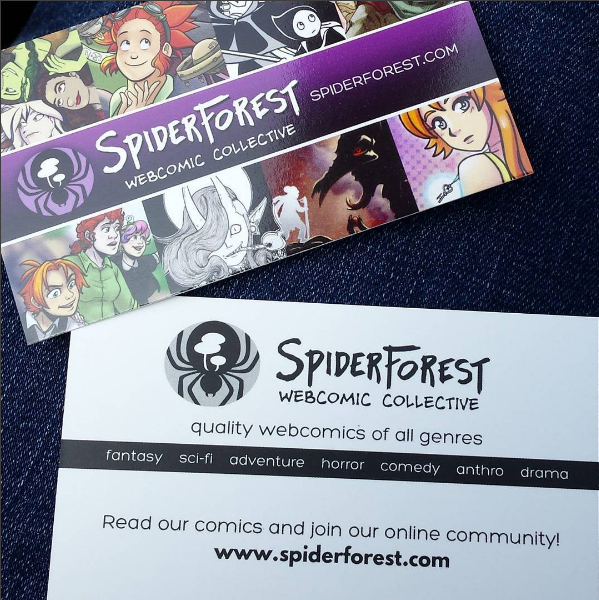 I made business cards years ago, I think it was something like 500 for $5 so super cheap ones, and I still have tons of them. Reading this makes me want to redesign them better, though. I found this thread really helpful for designing some business cards, so I thought I'd share the final result here! I got this set cheap on VistaPrint a month or so ago! The front has my name, tagline, Twitter handle, and the titles/URLs of both my comics. The dark parts of the artwork printed extra-dark - I'd adjust for that in future printings - but the text started out crisp & high-contrast, so it came through fine. And the back is blank white. They're a pretty standard cardstock, so I figure this gives me the option to personalize them when handing them out, using the space to write extra URLs/info or give people a personalized mini-sketch.